EASyCAP N8030: International | VIAVI Solutions Inc. The EASyCAP® Encoder/Decoder combines everything needed to deliver audio and video alerts in an integrated, one-box solution, including: EAS, CAP, local access messages, audio/video peripherals, control over serial and network based devices, interfaces for network management systems, and network protocols and interfaces. The EASyCAP® platform can receive all of the required alert messages and then control all of the devices necessary to deliver the messages to subscribers. It can also handle local access messages for franchise agreements. This next-gen solution not only handles all of today’s EAS requirements, but provides a flexible and expandable platform designed to accommodate requirements and features that may be needed in the future. As CAP standards and FEMA requirements continue to evolve, Trilithic’s innovative open architecture simplifies the process of making changes and adding new capabilities and features. All software and firmware can be upgraded across the Network. The EASyCAP® platform utilizes common interfaces such as secure web servers and SNMP, allowing standard tools to be used for management and monitoring. Four input channels are provided to monitor for EAS messages. Three of the inputs are configurable as external audio or optional internal radio receivers. All EAS inputs are decoded simultaneously and overlapping alerts are stored until they can be processed to guarantee that all incoming alerts are received and processed. Multiple user interfaces are provided to allow operators to encode EAS messages: front panel touchscreen LCD, telephone interface, general purpose inputs, and secure Web Server. This next-generation EAS platform is in compliance with all of the IPAWS CAP standards. The EASyCAP® allows multiple sources to be configured for receiving CAP alerts. Available CAP sources include: IPAWS Open Atom feed, ComLabs EMnet, AlertSense, Rave Mobile Safety, and Omnilert. Additional interfaces can be added as they are defined and required by FEMA, the FCC, individual State plans, and individual operators. Required Weekly Tests can be configured to be automatically generated at random times each week. Satisfying local franchise agreements, the EASyCAP® provides the ability for local authorities to send alert messages (audio and video) to subscribers, and the ability for operators to send administrative or informative messages to subscribers. Custom text and audio can be configured with the message and then played back immediately, or saved for playback at a later time. A Secure Web Server (HTTPS) is the primary user interface, providing an intuitive, easy to use interface for management and monitoring, configuration, testing, calibration, and log maintenance. The AM/FM/NOAA antenna kit is an ultra-wide range external receiving aerial with a usable frequency coverage of 30 kHz to 2 GHz - short wave/VHF/UHF. The AM/FM/NOAA Antenna Kit is designed for areas where space is a problem or when an "unobtrusive" installation is essential. 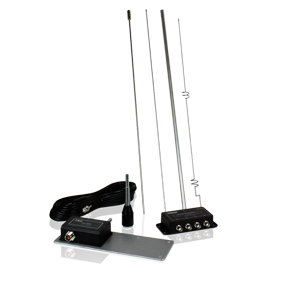 The Antenna Kit is a passive arrangement providing two whip elements: a long element for short wave up to 30 HMz and a second shorter loaded whip aerial for frequencies up to 2 GHz, the loading coils are tuned around 150 & 800 MHz to enhance performance of the UHF & UHF bands. The aerial is very compact being just 1.80m in total height. A single coaxial lead feeds both whips in a weather proof enclosure which in turn bolts to a suitable supporting mast (not provided). Approximately 15m of terminated coaxial cable is supplied ready to plug in and go! The AM/FM/NOAA Antenna Kit is easy to assemble and use, an instruction sheet is supplied with the aerial, "V" bolts and clamps are included but a small stub mast will be required for installation which should be as high as possible and in clear space. Run the coaxial cable to your listening location, the path should not be important but avoid power cables, TV downleads and computers. Should you need to remove the BNC plug make sure you have a spare to re-fit, if you have difficulty in locating a plug then another is obtainable for a small charge. If you need to extend the cable, always use a good quality 50 OHM coaxial cable such as UR43 or UR 76 (or quality RG58/U) and low loss connectors. If a long lead is required (20m plus), consider replacing the entire run with a heavier duty low loss cable such as UR67 or RG213. Network IP contact closure switch for remote switching in digital systems. The IP Contact Closure Switch is a switch that uses an IP message to activate. When used in conjunction with the EASyCAP series encoder/decoders, the IP Contact Closure Switch network contact closure can be used for remote switching applications, including activation of set-top controller servers or other remote devices. Simply connect the IP Contact Closure Switch to the device that needs to be activated and the management network. Program the EASyCAP series encoder/decoder to send IP-based messages to the IP Contact Closure Switch to activate the appropriate device. While many IP-based switching systems require transmitters and receivers, Trilithic has implemented the control of the devices within the operating firmware of the EASyCAP series encoder/decoder. This not only provides ease of use, it also reduces the number of IP addresses required to implement the system, and reduces the cost to deploy. The Trilithic configuration software contains the set up for the messages and the appropriate devices that are addressed and triggered when required. 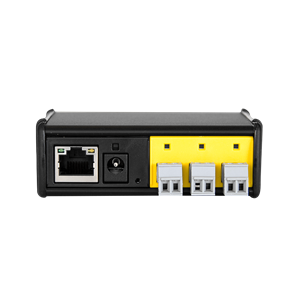 The firmware provides for location code routing of EAS messages to the associated IP Contact Closure Switch devices. The IP Contact Closure Switch contains two relay contacts. These contacts are normally open, but change states during EAS operations. Compliance Assistant software simplifies FCC EAS compliance through automation.